Update: It seems the cat is officially out of the bag. The new fitness tracker, dubbed the Microsoft Band, will be available in the US from Thursday for US$199 at both Microsoft's physical and digital stores. The device has 10 integrated sensors – including one to detect UV exposure and a special sensor to measure stress – plus a 48 hour battery life and is designed to be as open as possible to work across all platforms. There's no word on international availability yet, but given Microsoft's aspirations for the Band to become the centre of a health revolution, expect global rollout information in the not too distant future. Having consumed Nokia and shifted wholeheartedly into its own branded hardware, it's no surprise that Microsoft was working on its own fitness band. And now we have our first glimpse of the final product, courtesy of the Mac App Store. As spotted over at Gizmodo, Microsoft has published the Microsoft Band Sync app to the Mac App store, which just so happens to show off the as-yet-unannounced fitness band for the first time. The free app promises to let you "seamlessly sync your band to the cloud". It also promises a faster sync than your phone, when the device is charging over USB. The app also lets you edit your profile, and update the band's firmware. Naturally, there's no actual detail on the band itself, other than a single image showing the time and date on a narrow colour display. A pair of physical buttons rest on one side of the device, while a tiny hole - presumably a microphone - sits to one side of the screen. The App Store listing seems to confirm reports earlier in the year that Microsoft's first wearable would be a wristband rather than a smartwatch, with a longer display capable of showing the time, date and notifications from a smartphone. 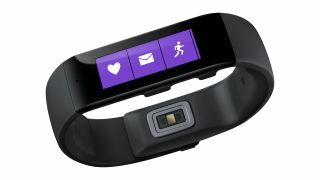 The earlier rumours indicated the Microsoft Fitness Band was slated for a Q4 announcement. The timing of this app release indicates we can't be too far off a full reveal.